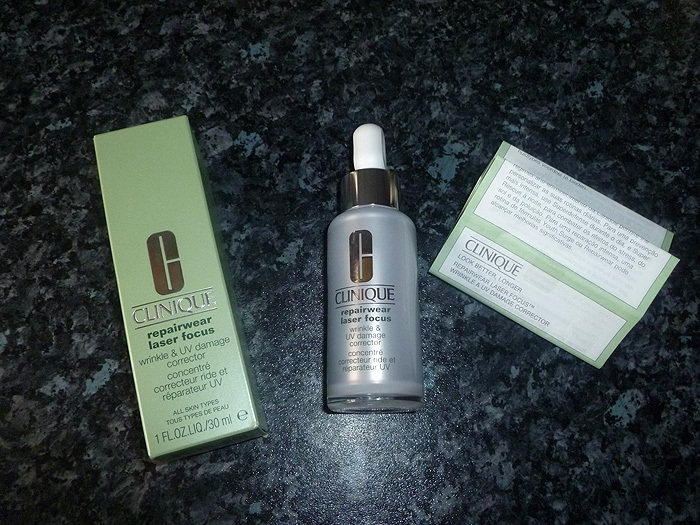 Back in September, I chose a reader to trial and review the new Clinique Repairwear Laser Focus – Wrinkle and UV Damage Corrector which had been picking up some rather fabulous reviews across the blogosphere. Helen kindly agreed to provide us with two reviews…. one partway through her trial and another once she’d completed the 12 weeks. Today, I’d like to share her thoughts on the product that she’s been using for the past 4/5 weeks. Okay – so Charlotte very kindly chose me to review this product – many thanks Charlotte. First impressions: Nice solid glass bottle with pipette type dispenser. Product itself is a milky fluid – 100% fragrance free and allergy tested. Love the bottle – looks and feels like it knows what it’s doing. Slight drawback in that you can’t see how much product you’ve got left at a glance but I’m only about halfway through so should last til the end of this review. What it promises: ‘striking improvements in as little as 4 weeks’… how does it do this… who cares…. oh, hang on… you do… let me quote… with ‘high-level peptides to boost the production of natural collagen’ and a ‘patented enzyme blend that works to mend visible UV damage’ So in just four weeks I should notice a ‘striking reduction in the appearance of lines and wrinkles. Usage: 3 to 4 drops to face and around eye area – twice a day. Product is easy to apply via the pipette, and sinks into skin quickly. Left my skin immediately feeling smoother and moisturised. Have to say at this point I was pleasantly surprised as I wasn’t expecting my skin to feel so much better so quickly – but there was a distinct improvement in the texture and appearance after only a few days. 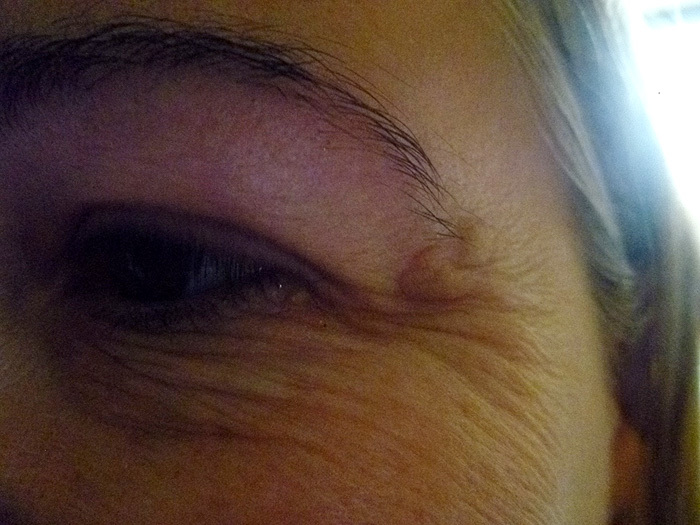 After four weeks – well….I do still have wrinkles/lines… BUT I would swear they are greatly improved in just this short time… please bear in mind the ‘after’ photo was taken after a very hectic weekend of late nights but even then I think you can see a difference. Thanks Helen, sounding really promising! Can’t wait to hear your final thoughts once you’ve completed the trial and thanks for being our guinea pig! Clinique’s Repairwear Laser Focus – Wrinkle and UV Damage Correcter is priced at £35.00 a bottle and available online or on counters nationwide. I agree with Ashley-are you squinting in that 1st photo? The poses don’t match too well. I don’t think that Helen is squinting… her eyelid or nose doesn’t appear to have any tell tale creases… but I think you’re right that she may be smiling in that first one? I’ll ask her if she can do a smiling “now” picture yes? If this is as good as it looks, there will be a stampede! I have been waiting for Helen’s report with keen anticipation and purse at the ready!!! and you guys are forgetting the power of photography, as Lipglossiping should know herself. These two photos are taken in completely different lighting conditions therefore can not be compared. I’ve already emailed and asked Helen a couple of days ago if she would mind taking another photo to get the pose/lighting as simillar to the first as possible. I can’t force anyone to do anything though… what would you like me to do? Remove the photos? Right… I’ve removed the 2nd photo. I try not to interfere with guest reviews, that’s kinda the whole point of them… but I’m not comfortable with the inference that I should know better. I do understand your concerns and as I’ve said, can only request an additional photo… if I get one, I shall update. I haven’t read the review as I’m not really interested in the serum, but I just had to let you know about something I found hilarious. An over eager sales lady for Clinique sold one of these to my 20 year old male friend! I couldn’t stop laughing when he told me! Why on earth would she flog something like this to a 20 year old?! Did Helen ever finish trying the Clinique Laser Repairwear? I keep wondering how it turned out b/c I may want to sample it. thanks!